Book your Hull to Rotterdam ferry today. If you’re looking to travel from the north of England to Holland, the Hull to Rotterdam ferry route is the most convenient route available. From Rotterdam, you can drive to Amsterdam, Delft and The Hague, all under two hours; or you can travel to Germany and Belgium since the borders are nearby. 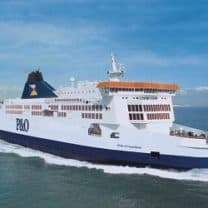 P&O Ferries is the only ferry company operating the Hull to Rotterdam route with sailing durations from around 11 hours. The crossing service operated by P&O Ferries operates up to 7 times each week, and the sailing takes place overnight. The frequency and duration of the ferry crossing may vary from season to season, so we advise you do a live check to get the most current information. P&O Ferries offers several types of ticket types such as saver, standard flexi, premier and premier plus. The ticket types provide travellers with the option of journeying on a budget or enjoying a bit of luxury. The Hull to Rotterdam ferry crossing takes place overnight so you can rest in your cabin, and arrive in Rotterdam first thing in the morning, fully refreshed for the day ahead. Rotterdam is the second largest city in the Netherlands and home to the largest ferry port in Europe. The city’s innovative architecture and many cultural attractions are a delight to tourists. Some of the breathtaking sights are the Euromast (with its elevated panoramic restaurant), the Museumpark and the famous Kunsthal Art Gallery. The Hull to Rotterdam ferry service offers you plenty entertainment throughout your travel on the sea. You can watch the latest movies in the cinema, or you buy gifts for your loved ones at the onboard shops. There’s also the children’s play area to engage younger travellers so you can have relaxed sailing experience. Cabins in the Hull to Rotterdam ferry are tastefully furnished to give you a relaxing night sleep while you journey across the North Sea. Cabins are equipped with en-suite bathrooms with shower facilities and relaxing beds so you can rest your head ahead of arrival at Rotterdam. P&O Ferries is approved by the Government Travel Scheme to allow travel with pets to and from the UK. This means you don’t have to leave your pet behind as you can take them along when travelling with P&O Ferries. The ferry crossing takes place at night so you can go about your daily activities in the UK and still make it to Holland the next day. The cabins on the ferries set the standard in passenger comfort so you can enjoy a night’s sleep on the sea and wake up to the sunlight in Rotterdam, ready to explore Holland. The crossing time for this route is 12 hours. Please make sure you are in good time, check-in closes 90 minutes before departure. P&O Ferries operates two ferries on the Hull – Holland route. The vessels are named: Pride of Hull and Pride of Rotterdam. The ships are equipped to offer top-notch comfort and entertainment with super ferry cabins, cinemas, lounges, kids’ area and a casino. For the best price, head to Direct Ferries to see the latest deals. P&O Ferries are one of the largest ferry companies, offering a variety of routes across Europe.